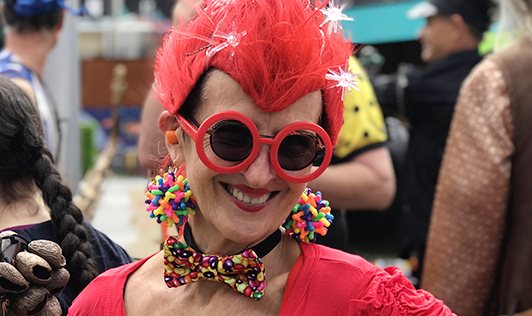 The NewsWire team joined three parades which converged to launch CubaDupa 2018 and captured the atmo sphere in this photo essay slideshow. In an overcast setting Wellingtonians turn out in their numbers today to enjoy the CubaDupa festivities. The festival began with Maori warriors flanked by colonists and they came from either end of Cuba Street. They met at Swan stage where a powhiri was held and Wellington MP Grant Robertson addressed the public and opened the festival. From there the crowds made their way through Cuba Street to the many stalls of artists, food, wine and song for everyone. The general feedback from members of the public spoken to by NewsWire was that it was a great festival and that everyone was enjoying themselves. Jillian from Wanganui says she loves the people that have come to be here and that she would “absolutely” come back again. Neil and Barry from Waikato, who are currently touring New Zealand, also said they “liked the people the most”. Lisa from Dublin (Ireland) who was with friends said she enjoyed what she has seen so far and she would come back again to the festival. Caroline from Mt Victoria said she loved the paua fritters and the nice happy vibe. Anne from Indiana (USA) has enjoyed the dancing and “the food was delicious”.